We restore the ring in your handbells! As a handbell owner and music educator, I believe it is necessary to have a practical, applicable working knowledge about the maintenance and repair of our chosen instruments: handbells and handchimes. 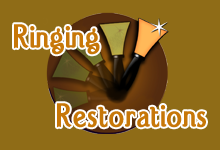 Due to the inquiries of customers and their need for regional service, I opened Ringing Restorations in January 2004. I have a fully equipped repair facility located in Custer, SD just southwest of Rapid City and am ready to provide the necessary services you require. I have received extensive training in the repair and restoration of handbells. I have years of experience in setting tension adjustments to provide the optimum response and have developed an “ear” for voicing the instrument for best tonal balance and blend throughout its’ range. The proof is in the sets of handbells I personally ring and those of the customers I have serviced. I am proud to be able to offer repair and restoration services to handbell and handchime owners and ensembles in the Rapid City, South Dakota and throughout the Midwest and in Canada.